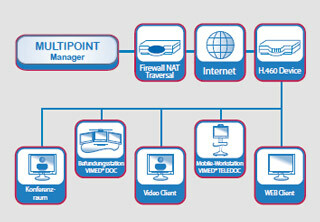 Die VIMED® Multipoint HD Suite has a particularly important task in the VIMED® product line. It is a web-based telemedicine solution for networks consisting of medical experts, if the physical presence cannot be provided. The telemedicine solution supports both health professionals and hospital facilities by the optimization and modernization of the traditional communication channels in the hospital, like phone or e-mail. The integrated unit for the multi-point video communication supports the synchronized communication in HD-quality with up to 36 participants. The VIMED® Multipoint HD Suite has all the characteristics of the advanced video conferencing systems and it is especially built for providing telemedical communication in medicine.